Eight-channel wireless system with lapel-worn microphones and bodypack transmitters. Perfect for events or performances, Nady’s flagship wireless system, the W-1KU, combines many features that set this system apart in the wireless industry. This is an eight-channel lapel-worn version of the system, which is additionally available in single, dual and four-channel versions. This one contains eight of the BT-1KU handheld mic transmitters. This package comes with the 8W-1KU dual receiver, eight BT-1KU transmitters. eight lapel-worn microphones, an AC adaptor, two removable BNC antennas, two extender cables for front-mounting the antennas, a user guide and a frequency chart. The The mics feature a roadworthy all-metal housing, Off/Mute/On switch, internal antenna system, feedback rejection and minimal handling noise. 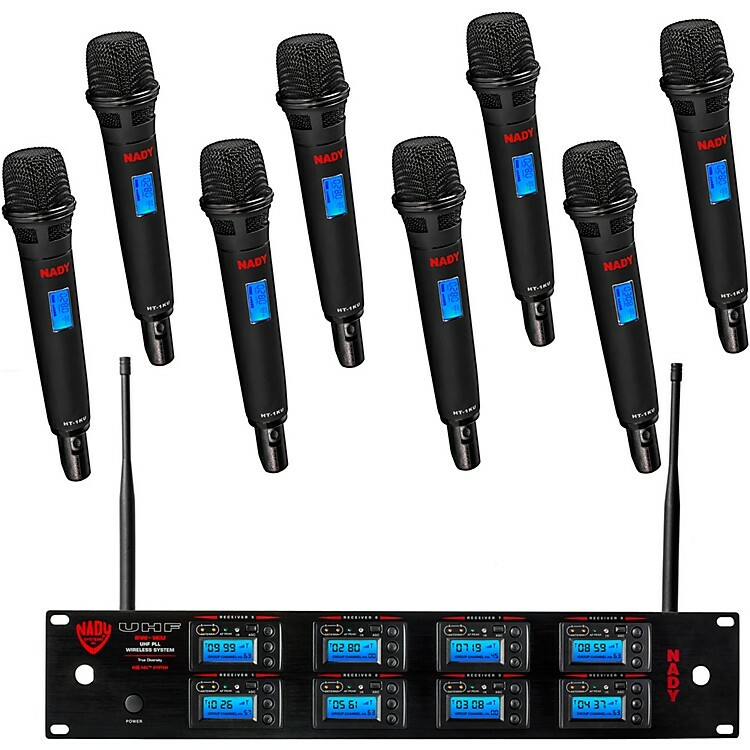 Eight lapel mic transmitters and a receiver that accommodates them all for one low price.